Hmm. Looks a bit neglected in here. A few things have happened since I last posted: (more than a few, but I’m confining this to items that might possibly be of interest to a reader). I had my first game tie-in story – Nalangu’s Trials – published by Abbadon in The True History of the Strange Brigade, to accompany the new Strange Brigade game they’ve put out. Nalangu was great fun to write. I was a judge for the 2018 Arthur C Clarke Award. (So. Many. Books.) I was hugely honoured to be asked, and actually managed to beat my impostor syndrome into submission long enough to offer a few opinions. (But seriously. So. Many. Books). Ann Charnock’s Dreams Before the Start of Time was a worthy winner, a book that covers important themes with quiet grace and great intelligence. (And we need another bookcase). I have a story – Gubbins and the ‘Munculus – coming out from the ever-wonderful Fox Spirit. You can read it for free if you sign up to their newsletter and become a member of the Fox Spirit Skulk. It’s been called a cult, but if it is it’s a very cuddly cult. I am working on one Very Long Project and a number of shorter ones, and am in the perennial Writer’s Limbo of Waiting To Hear About Things. In brief non-writing news, lost my dear elderly cat Schrӧdinger last year, only to have a scruffy starving scrap of barely-more-than-a-kitten start hanging around the garden a few months later. 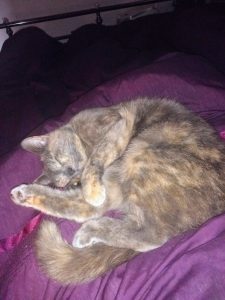 Attempted to find the original owners of said scrap, but although spayed, she wasn’t chipped, and putting her picture up on various pet-finder sites proved fruitless. So, we now have a cat again. Her name is Kismet, she’s not grown much despite having the appetite of an actual tiger, and she’s the most frantically affectionate creature I’ve ever known. She’s also very pretty. (Much prettier than my rather amateurish photography shows). I got engaged, to my long-term and long-suffering Beloved, at my favourite place in the world. So that was cool. (I, on the other hand, was not at all cool. I squeaked and sobbed, then grinned like a fool for about a week.). I acquired a step-grandaughter, who is the cutest baby in the entire universe – sorry, no arguments are at all brookable on this front. I won’t be posting photos unless and until she’s old enough to give permission, but you can take it from me, she is. And we’re back, folks, with the Mystery Box. (See the previous post). I thought that The Box only contained ideas, but it seems I was wrong. My filing can be…random. Especially when I’m tidying the room in a hurry because we have guests on the way. (OK by ‘filing’ I mean ‘shoving things in the nearest receptacle and promising myself I’ll sort them out later’). It turns out that some of the many pieces of paper in here are shopping lists – yes, people have created fiction based on shopping lists, but I suspect ‘Milk Catfood Don’t Forget Post Office!! !’ is unlikely to be a source of lasting creative brilliance. Although, you know, if you’re feeling it, go for it. There are bits of writing advice and occasional reading recommendations which I think mostly come from hastily scribbled notes while I was in the audience at convention panels. There is a postcard from my sister. There are notes of hotel booking numbers and train times. There are scrawled phrases which seem to hang in mid -air, hinting at lost meaning. Some of them were obviously written half-awake or possibly when not entirely sober. Sadly, the ones I have found so far are either incomprehensible or mundane and sometimes, even more sadly, both. (Although I’m still hoping that I misread the one that appeared to say ‘couscous enema’.). Scraps of a life. Any of these could, perhaps, be a source of inspiration to someone else, but when it’s your own life, it all looks a bit dull. However. There are some actual story ideas in here, so I have pulled out a few for your delectation. If they spark anything for anybody, I would be delighted to hear about it. A woman who is in the audience whenever a particular song is playing but who literally disappears when the music stops. An embroidered robe which looks beautiful until you get really close, close enough to see that it shows horrible and disturbing things. Who? Was he a real magician? A stage magician? Did I mean a worm as in dragon or did I mean actual earthworms? And why would anyone fight earthworms, which are good and necessary things? Next to my desk there are boxes. Resting on the top of the pile is a battered shocking pink storage box with a lid whose corners have all ripped, and whose once-white velour pattern is now mostly grubby grey. This is the Big Box O’ Writing Bits. It contains torn out notebook pages, scraps, a few entire notebooks. Things written on the backs of envelopes, (very old-school, that) the backs of vet’s bills and birthday cards. Things written in black biro, fountain pen (there’s posh ­– and old – I haven’t used a fountain pen in years), glittery pink or green gel-pen, occasional eyebrow pencil because I didn’t have anything else on me. Some of the scraps are bits of writing advice or thoughts about a project in progress, headed (eventually) for filing or dumping. Most of the rest is…fragments. Ideas. Bits of dialogue. Opening paragraphs. Things that I’ve not done anything with. Some of them are decades old, a lot of them end mid-sentence. Somewhere the next piece of paper floats in limbo. I no longer have any idea what the rest of the story or poem was supposed to be. I decided I’d post a few here. Partly as a reminder to myself that ideas are cheap, it’s the execution – and actually finishing the blessed piece – that matters. Partly because I really, really need to empty out that box. And partly for anyone to use as they see fit. Take from them what you will, if you so desire. So here are the first items out of the Mystery Box. A lonely young girl (absent father, depressed mother) who makes a ‘friend’ who isn’t a friend at all, isn’t in fact human, who starts draining her of something valuable, demanding she spends more and more time with him/it. “Don’t tell me you have,” B said. (Yeah, A and B, I know. I’m bad at coming up with non-human names at short notice). I want to tell you about how I died. Don’t look at me like that, you’re the one who asked. Well, of course I don’t look dead. There’s probably loads of us wandering around, not looking dead, but we can’t even spot each other, so how could you be expected to? That’s the point. If anyone does get something from them, and would like to let me know how it went, I’d love to hear, but there is, of course, no obligation. I used to live in a world where everyone was Normal. Everyone in my family, certainly. And all our neighbours, of course. Of course, there was the Polish guy living on the decrepit farm, who no-one ever saw, except when he came out to roar incomprehensibly at us if we rambled too close to his house. (Did someone say he’d been a prisoner of war? Do I remember that right? Not that I had any concept of what that meant, or might mean, back then). And there were the occasional stories my father told, making a joke of it, about the shakes and the nightmares and the weird reactions he had for years, probably decades, after the war. Oh, all a great laugh, don’t you know. Nothing to fuss about, certainly not requiring therapy or anything extreme like that. There were a few mentions of relatives – ours and other people’s – who were ‘eccentric’ or ‘odd’ or ‘tragic’, in passing, but nothing (whisper it) abnormal. And there was the neighbour who ‘had to go away’ at intervals. (Where to? Why? Why did everyone say it in whispers, shaking their heads, and talk about ‘her poor husband’? No one explained, it was just one of those mysteries of adulthood, wreathed about with an aura of discomfort and secrecy). And there was me. With my weird self-destructive habits. An odd child. Generally well-behaved, I just would insist on hurting myself. It was a phase, I’d grow out of it, other than that everything was normal. I was still doing it when I was in my teens. All the other girls at my school were, of course, perfectly normal (except me, by then I knew I was a freak). Well, there was the girl who got thinner, and thinner, and thinner. And the other girl who had sudden radical mood changes, who sometimes disappeared from school for days. A few things like that. Quite a few of us who were, one way and another, a bit weird, unsettling, gossip-worthy. Everyone else was normal. In college, everyone was normal too. Louder and drunker than I was used to, perhaps. Well, there was the student who attempted suicide. I mean, that was…perhaps, not quite normal, but…it wasn’t like I knew them, or anything. And the guy who went on these weird crying jags, which I didn’t know how to handle, and the woman who dropped out partway through her second year, she’d been having some kind of problems, apparently, and…well, most of us were away from home for the first time, all those academic pressures, some people just aren’t cut out for it. Quite normal, really. And me. Most of the time I passed for normal. But now and then I stopped being able to cope with life. Or people. Or anything. Stayed in my room for days, missing lectures, missing everything, creeping out to get food only when no-one was around. Yeah, I was a freak. But I was fairly good at acting normal. Eventually, I had a job and a partner and was generally, to the casual eye, a functioning adult. But there were still some things, like sobbing on the kitchen floor for hours, and self-harm, that weren’t really enhancing my life, and maybe admitting that and getting some counselling might actually help. It did. It was partially group therapy, and, amazingly, there were really quite a lot of other people there. Teachers and parents and till-workers. Surprisingly normal people. Of course, there was the employer who I had to ask for time off for these sessions, who warned me against telling people I was in counselling when I applied for my next job. Because it might look, you know, as if I had problems. As if maybe I wasn’t, well, normal. But over the years, as I met more people and made more friends and read more books, as people started talking about these things in something other than horrified whispers, I realised, actually, I was normal. Mental health problems happen all the time. Some are long term, some are temporary. Some are comparatively minor. Some are life-devastating. Somewhere around all of us every day, someone is dealing with this stuff, in one or more of its various manifestations. I don’t feel quite so much like a freak these days. It’s not that I don’t have some issues, some anxiety, some irrational fears and unhelpful reactions. It’s just that I’ve realised having these sort of problems is part of life. If everyone who has ever suffered any kind of mental health issue is a freak…well, us freaks, we’re the majority. We’ll be talking about sub-genres and the crossing of genre boundaries. This should be lively. Fri 9.45 – Party! My lovely publisher, Abaddon/Solaris, is having a get together. I will be there, as will other Abaddon/Solaris writers. There will probably be drink. Come and talk to us! Make us sign things! (Er..books, preferably). Sat 18:45 – 20:00: Panel: Religion, Faith and Geekery – What is the impact of religion on the geek genre? As someone who writes about gods and religion on occasion, I will be saying Things. Other people will also say Things. There is no guarantee that any deities will turn up to state their opinion, but you never know. Yes, I will also be Doing Stuff at the Gemmell Awards! Assuming there are no supervillain plots, alien encounters or anything else that delays me after the above panel…this is when you need a tardis. Sun 13:30 – 14:45 Panel: Support Groups for Writers – how to make them work. By this point I may be in need of a support group myself, or at least something to prop me up, but I shall endeavour to be coherent. Should be a good panel for anyone looking to join/set up a writing group. 1: The first published short story you have listed on your website was in 1998 – were you already writing and submitting novels then? How long have you been writing? I started my first novel when I was fifteen and managed six whole chapters, written in longhand and typed, very slowly, on a borrowed Imperial 66. I’d written two novels before I had my first short story published (which was, incidentally, only the second short story I ever wrote). I was a bit in awe of the whole publisher/author thing and clueless about submitting. It was only getting to know writers on the web, from about 1996 onwards, that taught me a little more about presenting and submitting my finished work. I did my first Milford SF Writers’ Conference [http://www.milfordSF.co.uk] in 1998 and meeting real writers, face to face, gave me a huge boost and taught me an enormous amount about not only writing, but the nitty-gritty of publishing. 2: Have you ever found the process of publication frustrating? What advice would you give to authors who are struggling with it? I think we all struggle with the lead times for publications and, when submitting to an agent or a publisher, the length of time it takes to get a reply, even a negative one. 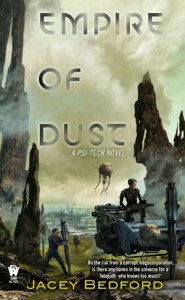 Empire of Dust, which is published by DAW in November, spent three years on the desk of an editor at another major publishing house. I left it there because that editor had said: ‘The first couple of chapters look interesting,’ which is flattering and, frankly, encouraging enough to pin your hopes on. However three years later, despite several nudges from me and promises to read it from her, nothing was happening, so I withdrew the book and started over from the beginning again. I’m pretty sure the editor had not actually read beyond the first two chapters. I understand. Editors are busy people, but it can be frustrating. I have to say, however, that DAW is a lovely company to work with. Though it’s part of the Penguin Group, now, it’s still got the ethos of a family firm. My editor, Sheila Gilbert, is hugely experienced and extremely insightful. She’s been a pleasure to work with. The only advice I can give is to be persistent. Stick at it despite the frustrations. 3: You are a professional folk singer and tour manager for folk artists: is folk music a strong influence on your writing? I’m sure there is bleed over. Sometimes a turn of phrase in a song will slap me around the chops and make me realise I need to look at something from a different angle. And I have written a YA novel based on the Tam Lin story. I think that’s obligatory if you’re a folk singer. It hasn’t been published yet, however, and at the moment it’s on a back-burner as I’m working on the three books that are part of my book deal with DAW. 4: Who or what do you feel have been other major influences on your work? That’s always a question I get stuck on. We are all composites of our life experience. I think my novels have little bits of everything from TV and movies and all the books I’ve ever read in my life, plus experiences of what I’ve done, from (lots of) horse riding to bringing up children and keeping a band on the road. 5: How do you relax when you’re working on a book? 6: You have two SF books coming out, and one which would more aptly be described as historical fantasy. It’s refreshing to see a debut author publishing in two different subgenres. Did this cause any difficulties when you approached agents or publishers? Do you have any advice for writers who want to do the same? DAW acquired my historical fantasy first and then asked what else I’d got. When my editor heard I had a completed space opera she was immediately interested. She read it, bought it, ordered a sequel and, in fact, both of those will be out before the fantasy. Way back in the 1990s I made the mistake of writing two linked fantasy novels without thinking it through. The second one was never going to sell until, and unless, the first one did, so effectively I wasted a couple of years. I learned my lesson. Every time I started a new project after that I made sure it was something a) that I wanted to write and b) that was completely different from anything I’d written before. So by the time I got my publishing deal I had a backlog of seven completed novels: two very different historical fantasies (different periods and locations); two linked second-world fantasies; a space opera; a YA fantasy novel and a middle grade fantasy novel featuring horses and magic (not magic horses). 7: Do you plan to branch out into other subgenres – or other genres altogether? I’ve always written fantasy and science fiction and I find it hard to imagine not writing SF of some kind, though some of it has been fairly light, and some has been much darker and more morally ambiguous. My short stories have ranged from rewritten fairy tales to hard science fiction and from slightly scatty fantasy romances to dark fantasy bordering on horror. I can see me branching out into subgenres of F & SF, but not changing genres altogether. 8: Do you have any further plans for books in either of the worlds you’re already writing in? Empire of Dust will be followed by a sequel, Crossways. They are already contracted, but I have plans for a third one in the series and possibly more. My first two linked novels are also set in the same universe as Empire of Dust, though possibly a thousand years in the future, when a colony founded in the Crossways book has become isolated. It reads like second world fantasy, but there’s no magic, only humans with psionic talents who may well be descended from the settlers in Crossways. My historical fantasy (I’m not being coy about the name. Its working title is Winterwood, but that may not be what it ends up being called.) can be a stand-alone, but there’s room for a sequel. It’s already in the same universe as my middle-grade horse book even though it’s separated by 200 years. 9: Are there trends in SFF you find interesting at the moment? I think, like many people, I’m holding my breath to see what will follow ‘grimdark’ and ‘dystopian YA’. It’s interesting to see fantasies based on cultures other than generic Medieval European, I don’t know how much of a trend that is, but diversity is always welcome. 10: What would you like to say to your future readers? Buy my book. Buy my book. Buy my book. 🙂 But seriously, I’d also like to say thanks for joining me on the journey. Every new reader has a different take on the books they read. We, as authors, may think we know what we’re writing about, but readers will always absorb different things from our words and put their own spin on a story. I’m always happy to hear from readers, so please talk to me. Also I’d like to say that in these days of fewer book outlets on the high street leading to fewer opportunities to browse, that readers are not just the consumers of the publishing industry, they are a vital link in transmitting information about new books. Word or mouth, blogging, Goodreads reviews, Facebook and Twitter are now an essential part of getting the information out to potential new readers. Please, if you enjoy a book, (not just my book, but any book) talk about it, email your friends, mention it on Twitter, Tumblr and Facebook, stick it on Pinterest, blog about it, leave a review on Goodreads and Amazon. You have an important part to play in the health of the publishing industry. Together we are mighty. Thank you. Is there anywhere in the galaxy that’s safe for a Telepath who knows too much? Implanted with psi-tech technology, Cara Carlinni is on the run from Alphacorp, a megacorporation more powerful than any one planetary government. She knows her ex-boss can find her any time, mind-to-mind. Even though it’s driving her crazy she’s powered down and has been surviving on willpower and tranqs, tucked away on a backwater space station. So far, so good. It’s been almost a year, and her mind is still her own. But her past is about to catch up with her, and her only choice is run or die. She gets out just in time thanks to Ben Benjamin, a psi-tech Navigator for Alphacorp’s biggest corporate rival, however it’s not over yet. Cara and Ben find themselves battling corruption of the highest magnitude. If they make a mistake an entire colony planet could pay the ultimate price. Jacey Bedford is an English writer who lives and works behind a desk in Pennine Yorkshire. She’s had stories published on both sides of the Atlantic and in November 2014 her first novel, Empire of Dust – A Psi-Tech Novel, is published by DAW in the USA as part of a three book deal. 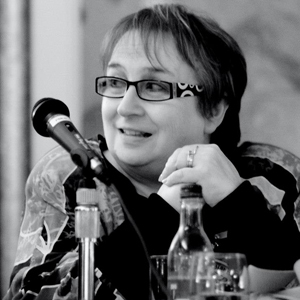 She is co-organiser of the UK Milford Writers’ Conference, a peer-to-peer workshopping week for published SF writers, and she organises Northwrite SF, a critique group based in Yorkshire. She’s been a librarian, a postmistress and member of internationally touring a cappella trio, Artisan (and still occasionally is for reunion gigs). When not writing she arranges UK gigs for folk artists from all over the world. The inimitable Chuck Wendig just put a new fiction challenge up at his blog Terribleminds (if you’re interested in writing, publishing, horror/sf/fantasy, and/or the antics of small children, and you’re not reading him, you should be. He’s very sharp, and very funny. Oh, he swears a great deal with a kind of feverish inventiveness, so you probably shouldn’t read him if that bothers you, but you’d be missing a lot). The challenge was to write a flash horror story in the form of a spam email. This is what my brain decided to come up with, possibly influenced by reading too many productivity blogs lately. Do you spend hours a day deciding what to watch? What threads to read? Who to follow? Who to ban? What to buy? What restaurant to book? Where to go on holiday? What job to apply for? Who to date? Now you can be free! Autoclick is here! We are so convinced you will love Autoclick and all its features that it is already downloading. Don’t worry, you don’t have to do a thing. Thank you for downloading Autoclick! Now Autoclick is installed, you will be freed from all those difficult timewasting decisions. Autoclick – your very own combination personal secretary and life coach! Autoclick is now synced to all your other devices. And those of everyone you know, or may at any time interact with. Using our unique Quantum Forward Planning feature, it is also synced to every device you or anyone else may own at any time in any future. Be free of unnecessary struggle. Be free of timewasting choices. You need never make another decision. 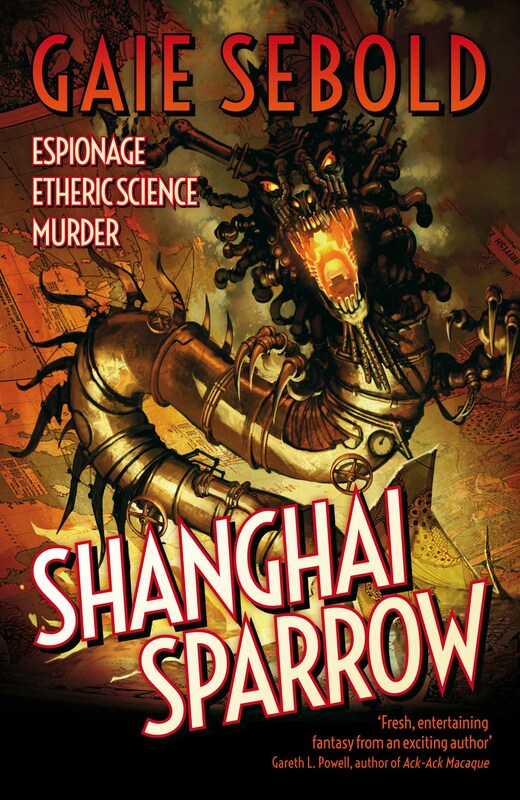 I am delighted to announce that the lovely Solaris Books have commissioned Sparrow Falling, a sequel to my steampunk novel Shanghai Sparrow – (read an extract here). Sparrow Falling is due out in summer 2015. So, generally, a pretty good few weeks…apart from hearing about the deaths of Clive Wolfe of the NSDF, a man of immense passion and commitment, whose work had huge positive effects for so many people, gave me some of the maddest and most enjoyable weeks of my life and brought me some of my longest-standing friendships, and of Rik Mayall, who I never met but who was cool and talented and funny. Those, yeah, not so good. Where she allows me to witter on about my very messy writing process on Shanghai Sparrow in her otherwise elegant abode.